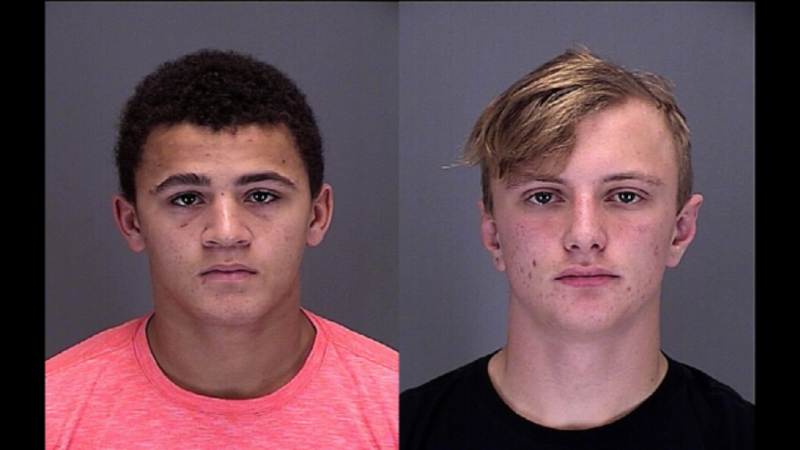 Wyatt Eugene Tungland, left, and Dalton Lee Nagel, both 18, are charged in connection with the beating of a 16-year-old. The alleged beating of a high school football player – allegedly by four of his teammates — has a small Minnesota town debating the topic of bullying. The four players at Blue Earth Area High School, ages 16 to 18, face felony charges — including third-degree assault causing substantial bodily harm — and aiding and abetting. Authorities say an 18-year-old senior, Wyatt Tungland, is accused of punching a 16-year-old teammate in the face and head while the other three teens held him down. Tungland’s attorney, Chris Ritts, says witness accounts don’t support the charges. The alleged assault reportedly happened at a house party Oct. 19 in Winnebago, Minn. The victim told police he had been in a dispute with one of the suspects, was pushed down, punched in the face and knocked unconscious. According to the Minneapolis Star-Tribune, the 16-year-old’s parents didn’t learn about the alleged assault until days later, as their son’s headaches and vomiting continued. A doctor determined the teen had suffered a concussion, the newspaper reported. Since the report of the alleged beating, the 16-year-old’s parents have demanded action from the local school board, but say they have been frustrated. “Everybody’s getting bullied, and I believe it’s getting covered up,” Dale Hurley, the boy’s father, said at a school board meeting. Tonya Hurley, the boy’s mother, told the newspaper that while her son was home, injured and ill, the four suspects went on to play in their team’s state playoff game. Authorities arrested the suspects last week — days after Blue Earth was eliminated from postseason play, the Star-Tribune reported. Winnebago Police Chief Eric Olson said it was unclear why it took three weeks for the assault to be reported to police, Fox 9 reported. Some parents at the school board meeting suggested it may have had to do with the suspects being star players on the football team. In addition to Tungland, who was charged with third-degree assault and aiding and abetting third-degree assault, senior Dalton Nagel, also 18, was charged with third-degree aiding and abetting. The two other suspects are minors. Schools Superintendent Evan Gough told the newspaper a plan will be developed to better respond to bullying in the district’s schools. He said he’s heard that some students are reluctant to report bullying for fear of retaliation. The suspects were released from jail pending further court action, the Star-Tribune reported.